Rising Dutch star Quintino provides a master class in humility, giving back to his fans and explaining why you should never go soft..
Not everyone is fortunate enough to be able to say that they love what they do. Quintino doesn’t have to. With a broad and gleaming smile across his face and an infectious laugh in his voice, the excitement and love that he possesses as an artist is radiant, making his love for what he does obvious without him having to even speak. Demonstrating his skill set from an early age, Dutch native Quinten van den Berg, otherwise known as Quintino, has effortlessly inserted himself into the stratospheric heights of dance music stardom and labeled himself as one to watch. Stemming from a musical family, van den Berg’s talent is a combination of both nature and nurture. With his father the owner of a nightclub in their native town of Den Helden, van Berg found was immersed in a variety of different musical genres and cultures from a young age. As he grew up, his love of dance music became fully realized, and at the age of fifteen he found several outlets in which he was able to experiment and further develop his musical interests. “I really wanted to play dance music, so I started organizing my own parties just so I could play. I started to play parties just to be able to play all the records that I loved. That was when my love for dance music became big,” he tells DJ Mag USA. “For me, it was amazing. I had always dreamed about it. It was only the first steps forward, but I knew when I was young I was always thinking about how I wanted to do something. When you accomplish your first steps, it makes you really happy.” Those first steps would soon grow to be the stepping stones towards a mentor/mentee relationship with fellow Dutch artist Laidback Luke, who would play an integral part in Quintino’s development as an artist and help to lay down the foundation for several hits to come. Beyond being an important aid in Quintino’s production process, Laidback Luke would also provide the then 18-year-old van den Berg with advice that would last a lifetime - to always connect with your fans. “From day one that I met him, he came off as a really humble person. He’s a really big artist, but as a person he’s really humble and I really appreciate that. He gave me a lot of tips. He told me to always be gentle, to take care of your people and take care of the fans that you’re going to get in the future, because they make sure you get a good crowd and they will make your career.” Lessons such as these have allowed Quintino to go far, giving him a sense of humility and a grounded nature that continue to resonate today, not only as a musician but also as a person. 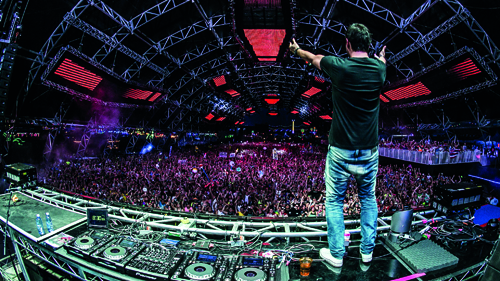 Having signed to one of dance music’s premiere record labels, Spinnin’, in 2013, Quintino has been able to solidify his place in the electronic music elite. This year saw the release of his biggest single, “Go Hard,” a mentality he has incorporated into his daily life. With its big room sound and its crashing drops, “Go Hard” is every bit as heavy as the title teases. 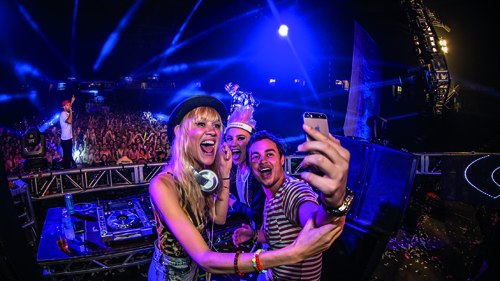 Having stacked up over four million views on YouTube, the track is a major contributor to Quintino’s current success. 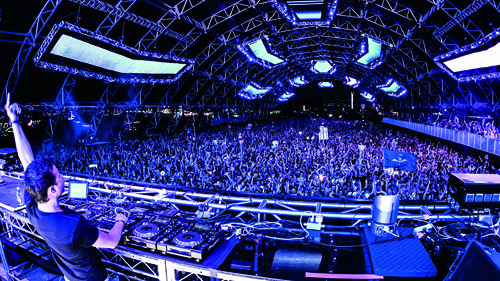 This year, he has made it his goal to reach the DJ Mag Top 100, a title that has eluded him several times in the past. Encouraging his fans to “Go Hard Vote Hard,” van den Berg has taken a different approach to the campaign process. Rather than a straightforward approach, van den Berg has tilted the idea of the campaign video on its head. Selling the idea of “Go Hard” as a parody of erectile dysfunction commercials, Quintino serves as a the cure to making sure all his fans “don’t go soft.” Says van den Berg, “The idea about that is that we also want to do fun stuff, I like to make people laugh. It doesn’t have to be that serious all the time. You can listen to my music, you can party at a festival I’m playing at, but a good laugh is really important. We came up with the idea, and we really, really like it. It’s a parody, of course, but I think people will undenstand that about it. It puts it in a different perspective.” Letting his sense of humor to shine through, Quintino’s video campaign is one that doesn’t feel forced or contrite, and furthers his warm sense of comfortable familiarity with his fans.